There were forty-five witnesses to the shooting and none of them saw anything. Of course that was impossible, most of them knew who shot McElroy. In a news report about the killing, the announcer reported the Ken was “the most hated and feared man in Nodaway County.” Even the police and at least one judge were afraid of him. He had a history, he robbed, raped, burned (as in committed arson), and shot the citizens of Skidmore, Missouri. If anyone pressed charges, while waiting to go to trial, his lawyer would delay the trail as long as possible and McElroy would terrorize the witnesses. In one case, the bedroom window of a witness faced the road. He and his wife would wake to find a bright light flashing around the walls. When the husband would peek out the window, he say McElroy’s car parked on the road. As a result of these tactics, many times witnesses changed their stories or simply disappeared. Often the victims trying to get justice felt isolated because everyone was too afraid of McEroy to support them. With all this it is easy to see how the townspeople felt the only way they could get justice was to take matters into their own hands. And so they did. The media called the shooting a vigilante killing which the town objected to, and in the strictest sense of the word it wasn’t, but still …… there is no denying the fact that some people made themselves judge, jury and executioner. 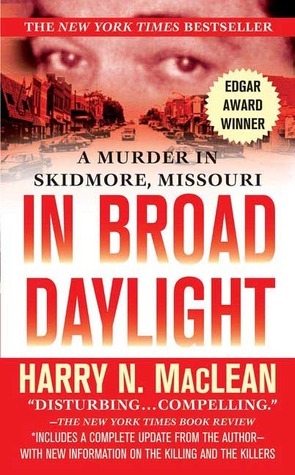 MacLean interviewed the people of Skidmore, he also consulted interviews that were taken right after the shooting, by a person who was not law enforcement. We get the full life story of Ken McElroy, MacLean also takes us through the year so we get a feel for the type of community it was. He also explains the idiosyncrasies of Missouri law, which is another reason people may have felt McElroy was getting away with his crimes. The fear and inaction of some people may have also fueled the towns peoples frustration and while you may not agree with their actions, you can certainly understand it. One person I felt sorry for, which some may not understand or agree with was McElroy’s wife Trena. I feel she is another of Ken’s victims, her actions after he was killed are understandable and can be explained. I enjoyed this book and recommend it to true crime fans. Posted by Belleza on December 21, 2014 in Non-Fiction, True Crime and tagged 3 Stars, eBooks, Harry N. MacLean, Kobobook, Liked it ♥♡, Missouri, Murder, My eBook, Skidmore, vigilante killing.